Your dentist may recommend a night guard if he/she suspects you grind your teeth while sleeping. What is a Mouth Guard for Grinding Teeth? A teeth grinding mouth guard is a device that is meant to protect your tooth enamel from the effects of grinding. The TMJ mouth guards are also known as occlusal guards, night guards, bite plates, or occlusal splints. 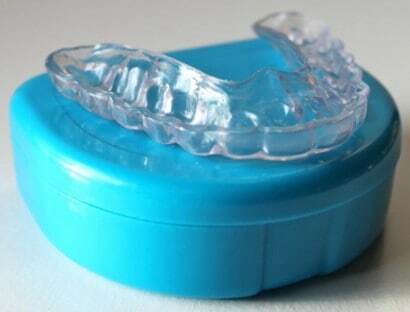 Night grinding mouth guards are affordable and easily available without a prescription. Most mouth guards are sold over the counter. However, there are some that are custom made for specific consumers. Many people find out about the habit of grinding teeth during a dental checkup. If a dentist notices cracks, misalignment and wearing out of your teeth, he may advise you to protect your teeth using a mouth guard. 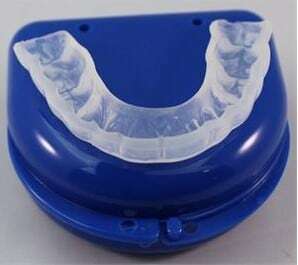 There are two main types of dental mouth guards; custom-made guards and over-the-counter guards. Custom made guards are made specifically for you. The teeth guards are comfortable, durable, and of high quality. To get a custom guard, the dentist will need an impression of your teeth. The impression will then be taken in a specialized lab to make a mouth guard for you. While the grinding guards are cheap, they provide a temporary means of protecting your teeth until you get a custom-made mouth guard. Oer the counter mouth guards have to be boiled to soften before biting into them to create an impression of your teeth. When the impression is made, the guard will fit in the mouth. We’ve reviewed the best TMJ mouth guards to help you find the right option for yourself, kids or loved ones. In the reviews, we’ve given an overview of the products, highlighted the pros and cons and rated them based on online user reviews. We’ve also included links to online sites where you can buy the mouth guards. Pro Teeth is made by a dental lab located in San Diego, California. The lab has been in business for over 15 years, delivering thousands of perfectly fitting custom night guards, dental crowns and bridges, dentures, and mouth guards to dentists in the San Diego area. Today, the company also delivers its night guards to customers through its website. The cost of the night guards starts from $100 (check the current price here) depending on the style. This amount is much cheaper compared to what most dentists charge for a custom mouth guard. We tested the hybrid Pro Teeth night guard for this review. The night guard is hard on the outside, has a soft interior, and fits comfortably. This guard is good for moderate to heavy grinders. Depending on your degree of grinding, the night guard can last for 2 to 5 years. The Pro Teeth Guard we ordered was shipped fast. A package comprises of an impression kit and four containers of putty, two different-sized mouth trays, and a prepaid envelope to return your completed impression. There are clear instructions with photos that show how to go about making your teeth impression before the putty hardens. In case you don’t get the impression right, you can request for free putty from the company. After making your teeth impression, put it in the prepaid envelope and send it back to Pro Teeth Guard. The company’s lab technicians will make your night guard using the impression. In about a week’s time, your finished night guard will be sent to you. Pro Teeth night guards are made of high-quality materials. Since they are custom made, they fit great. The bruxism guards are not bulky and do not move around when you sleep. Moreover, they help to stop teeth clenching, which means no more jaw pain or headaches! Pro Teeth Guard is the best night guard for teeth grinding. If your doctor has been encouraging you to get a night guard but you couldn’t afford one, we highly recommend getting Pro Teeth Guard. These guards are at least 50% cheaper than what you would pay if you ordered directly from your dentist’s office. Moreover, they are custom made, provide a good fit, are comfortable, and stop teeth grinding. Read the full review of Pro Teeth Guard here. Where they are fitted. Do you want a top or bottom fitted night dental lab? The severity of your teeth grinding. The night guards are designed for light, moderate, and severe teeth grinding. J&S Dental Lab guards have a soft inner section, which ensures a comfortable fit, and a hard outer surface that makes them durable. 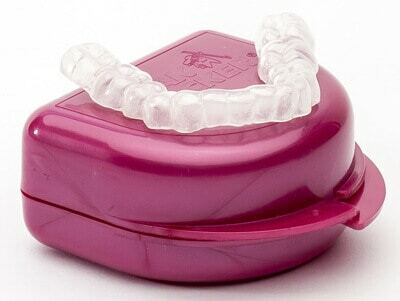 The teeth grinding guards are made from high-quality materials and are BPA-free. 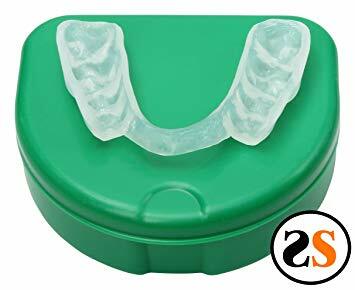 When you order your J&S Dental Lab night guard, you will receive 3 different-sized mouth trays to choose from, putty, and a prepaid envelope. Use the putty to take the impression of the teeth, put the mold in the prepaid postage envelope, and then send it to J&S Dental Lab. The J&S Dental Lab pack comes with easy step-by-step instructions on molding your teeth. The company also offers free dental guard adjustments and ships the items for free. Finally, you have nothing to lose to try the guard thanks to the company’s “No Questions Asked Money Back Guarantee”. J&S Dental Lab mouth guard reviews on Amazon are positive. Even professionals dentists have left reviews regarding the effectiveness of the night guard. Read the full review of J&S Dental Lab here. Sporting Smiles has 6 different night guards for teeth clenching. The teeth guards are designed for different levels of clenching or grinding, are custom-made by qualified and certified lab technicians, and are latex-, DEHP-, BPS-, and BPA-free. When you order Sporting Smiles night guard, you will receive a self-impression kit for creating the teeth impressions. The kit comprises of a prepaid return envelope, instruction pamphlet, 1 return bag, an adjustable impression tray, and one set of impression material. Sporting Smiles mouth guards fit perfectly since they are custom made for your teeth. The putty does not leave a bad taste on your mouth and the grind guards are BPA-free. These guards are made of long-lasting materials, which means you will not replace them often. 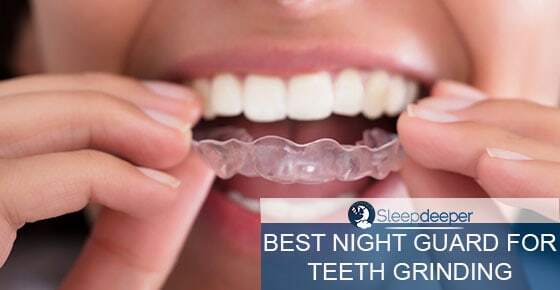 Most importantly, the night guards help to stop teeth clenching and grinding. Read a comprehensive review of Sporting Smiles custom guards. The Sentinel night guard is a custom-made dental guard that prevents clenching and grinding. The guard is customized to fit your teeth either on the top or bottom. All bruxism guards from Sentinel are BPA-free and FDA-approved. There are 3 models of Sentinel Night Guards. To determine the right Sentinel night guard to order, consider the severity of your grinding and whether you will be comfortable wearing a soft or hard night guard. Most people choose the top night guard. However, if you have broken teeth, you may want to protect them. Therefore, the condition of your teeth should help you decide whether to go with a lower or upper guard. If more broken teeth are on the lower jaw, go for a lower side night guard. When you order a Sentinel mouth guard, you will receive an impression kit that comprises a teeth tray, putty, molding instructions, and a return envelope. 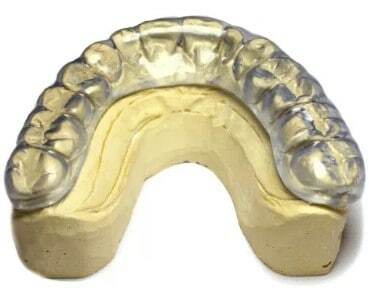 Make your teeth impression and mail the mold to the company for your custom guard to be made. Sentinel Custom Guards are among the best night guards for teeth grinding on the market. The guards fit well, are comfortable, and durable. Moreover, they are made from hypoallergenic materials. Read the full Sentinel Custom Guard review here. TeethNightGuard is made by a private company that manufactures dentist-lab-quality night guards for TMJ, clenching, and grinding. Like is the case with the custom night guards we have featured above, TeethNightGuard offers 3 different types of mouth guards that are designed for light, moderate, and severe teeth grinding. You should choose a guard depending on the extent of your grinding or clenching. Apart from this, you have to decide whether to go with a top or bottom nigh guard. TeethNightGuard is made in the USA and is FDA-approved. The clenching guards are comfortable to wear and fit the mouth properly. Apart from this, they are durable and can last for 2 to 5 years, depending on the severity of your grinding. Read the full review of TeethNightGuard here. To avoid constantly replacing your night guard, it is important to properly care for it. You should clean it on a daily basis as a daily oral health routine. Read on for instructions on cleaning your night guard to avoid constant replacement. Many people store their night guard in the bathroom. This is not recommended because, with time, humidity and steam in the bathroom can make the night guard to warp. The best way of storing your night guard is in a case and on your nightstand or bedside drawer. Many people promptly clean their night guards but forget to clean the carrying case. This is a waste of time and effort.. Wash your case every other day with regular dishwashing detergent. However, do not place the case in the dishwasher at high temperatures. Doing so may warp the plastic case. After washing, let the case dry to prevent the growth of bacteria. Night guards cases wear out with time. You should, therefore, replace your case after every 6-12 months, or as soon as you see necessary. Immediately after removing your night guard, brush it with a normal soft-bristle toothbrush. You can buy a separate toothbrush for doing this. If you wish, you can also use your toothbrush to clean the night guard. Toothpaste can be abrasive and might cause your night guard to wear out faster. Therefore, do not apply any toothpaste to the brush you use for cleaning your guard. To loosen any plaque stuck on the night guard and to remove any debris, rinse your night guard every time after removing it. Bacteria thrive in moist conditions. Therefore, ensure your night guard has completely dried before storing it. If you place your guard on a clean flat surface, it should be dry in about 30 minutes. Form a habit of regularly deep cleaning your night guard. This should be a weekly routine. There are several deep cleaning methods you can choose. Put a sizeable amount of the denture cleaner in a bowl or glass of water and allow it to completely dissolve. Finally, remove the night guard and dry it appropriately. You can also clean your night guard using a mixture of mouthwash and water. Remove the guard, rinse it with clean water and dry appropriately. The last deep cleaning method is to use a mixture of hydrogen peroxide and vinegar. Rinse the night guard with clean water and let it dry appropriately. NOTE: Never let your night guard soak for more than one hour. Extended time in the liquid can cause the guard to wear out even faster because of the material it’s been made of. As hectic and overwhelming as it may seem, cleaning your night guard properly is very important. Not only will this ensure the guard serves you longer, but will also prevent you from suffering from other dental conditions. Creating a routine for cleaning your night guard is the hardest part. Once you get used to the idea, it will be easy.